This is a photo of barium. Barium is a soft silvery-white metal, but it oxidizes very easily in air. Natural barium is a mixture of seven stable isotopes. Thirteen radioactive isotopes are known to exist. Barium has a melting point of 725°C, a boiling point of 1640°C, and a specific gravity of 3.5 (20°C), with a valence of 2. 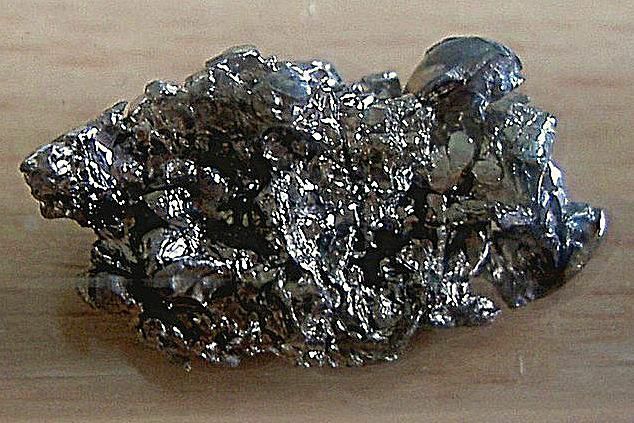 Barium is a soft metallic element. In its pure form, it is silvery white. The metal oxidizes readily and should be stored under petroleum or other oxygen-free liquids. Barium decomposes in water or alcohol. Impure barium sulfide phosphoresces following exposure to light. All barium compounds that are soluble in water or acid are poisonous. Barium is used as a 'getter' in vacuum tubes. Its compounds are used in pigments, paints, glassmaking, as weighting compounds, in the manufacture of rubber, in rat poison, and in pyrotechnics. Barium is only found combined with other elements, primarily in barite or heavy spar (sulfate) and witherite (carbonate). The element is prepared by the electrolysis of its chloride.